Advent is a time for preparation and for longing for the coming of the Lord Jesus. Preparing for the opening of St. John Paul II Catholic High School gave us a great longing for meeting our students and their families. 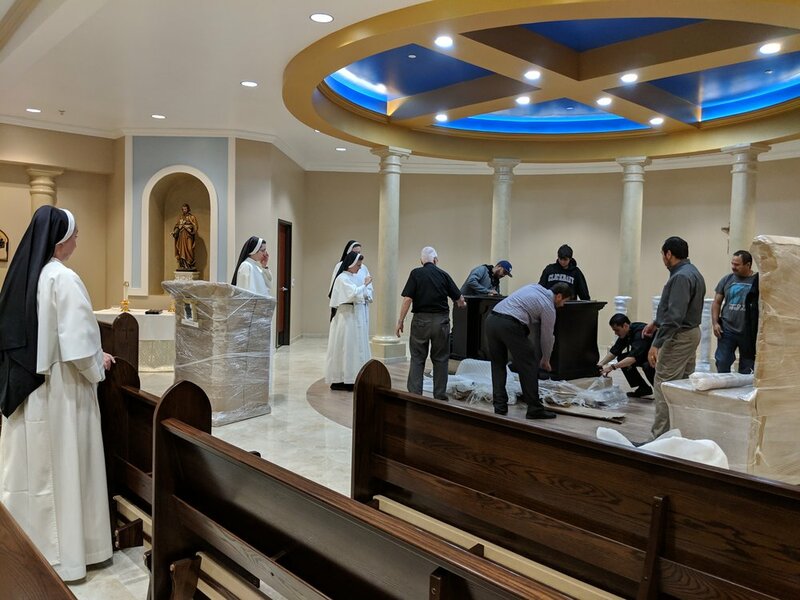 Waiting for the arrival of the chapel furnishings gave us a great longing for the day when the tabernacle will hold the Lord Jesus so that each of us can meet Him in the chapel whenever we wish. When the furnishings arrived, we swiftly brought them to the chapel and unwrapped them. Then we put them in place, dusted them, and dreamed of their use. Isn't that the point of Advent? We take the furnishings of our souls--prayer, works of mercy, and acts of charity--and bring them to the Lord, cleaning and arranging, and putting God first. As the chapel began to look more and more beautiful, our joy overflowed in song. As our Advent makes our souls more and more beautiful, the joy of our salvation will come out in songs, hymns, family meetings, and praise. Come, Lord Jesus; come and make us one family for the praise of Your glory this Advent. Older PostAre we supposed to be happy?